The "Awaking Mode" that Shoutmon X7 powers up into by turning several desires for peace into strength. 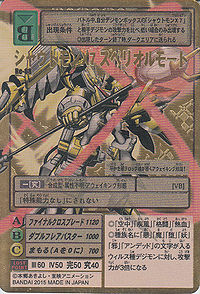 It possesses wings of holy light, with the aura flowing from its Gold Digizoid shining even more brightly. While carrying all hopes on its shoulders, it fights evil in order to guide the Digital World to peace, concentrating its blazing heart into the "Burning Rocker". 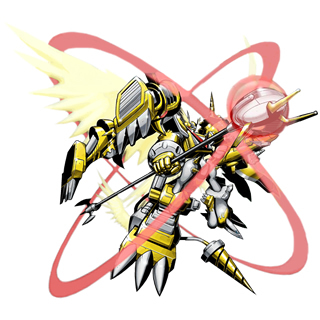 n., From DigiXros and the number of Digimon comprising Shoutmon X7, or in this case the number of Digimon comprising the basic physical appearance of this Digimon. n., Greater or better than average. 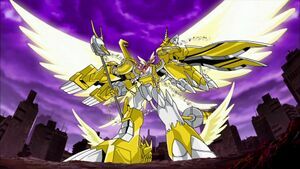 Anime/Manga Digimon Xros Wars: "Glorious DigiXros, Seize it! Our Future!!" Shoutmon is a member of Xros Heart and the partner of Kudou Taiki. 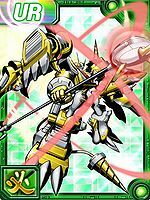 At the climax of the fight against Darkness Bagramon, he merges with the Code Crown and practically every Digimon alive to form Shoutmon X7 Superior Mode. This Awaking Mode is guided by a soul of rock that wishes for peace! 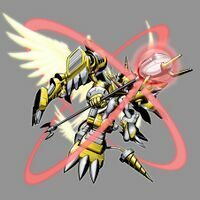 ↑ 3.0 3.1 Digimon Xros Wars: "Glorious DigiXros, Seize it! Our Future!!" This page was last modified on 12 October 2018, at 18:14.